Article: Growing grapes in north Bali North Bali is an area where we find diverse agriculture and plantations. Over the years The Lovina Pages paid visits to a colorful pallet of farmers, young and old ones using modern or traditional ways of farming, noting down their stories for our readers. We stumbled across people minding traditional crops, like rice, newer once, like coffee and brand new ones like dragon fruit. However there is one crop which speaks to the imagination of many people originating from wine drinking nations, and this is the grape. I once compared my personal experience of having visiting friends in the car on a trip around the north of Bali, with almost every single person notifying: “You have grapes, you have wine”. All is well. And it is true we see a lot of vineyards from the main road connecting west with east Bali especially along the roadside between Lovina and Banjo and Gerokgak. But is is also noticeable that many vineyards have disappeared. So time to pay a visit to a wine farmer. 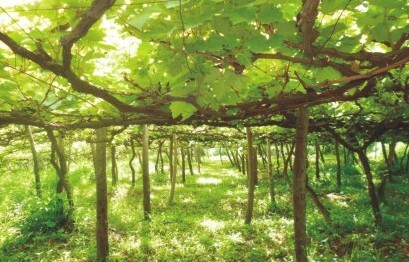 We visit the vineyard of I GustiPutuInLokapaksaSadia. A farmer would not be a farmer if he would not start his story lamenting about all the hardship that comes with farmer especially the weather. Drought and too much rain, a lack of sun and yet always too much on a bright day. I Gustiexplains he is one of the surviving farmers in his are claiming most farmland in the area has been turned into building land. After the explanation of the hardship a farmers’ life is he continues with as much enthusiasm how he maintains his vines with great care for, as we can guess, the grape is a complicated fruit to maintain under the climatological circumstances of Gerokgak. The land is low, a plus and the soil is loose, excellent so far. It is important to be close to a water source, because water is needed in bog quantities. However, water on the leaves is a big no, so I Gusti only waters the feet and prays for no rain which will make the grapes to rot and leave the plant with only leaves for a long time. Water management is the word. Before harvesting water becomes even more important whilst the vines should be doused with water weekly. By this tome the leaves will be cut because they hinder the growth of the fruit. We are happy to learn I Gusti can harvest his grapes every four months. Although there is unstable revenue, we understand, and the price for the fruit per kilo will vary from Rps 5.000 per kilo – Rps 15.000 per kilo, which is a big difference of course but when we explain in many countries grapes are harvested only once a year the moods go up again. We should at the end of the day always count our blessings.